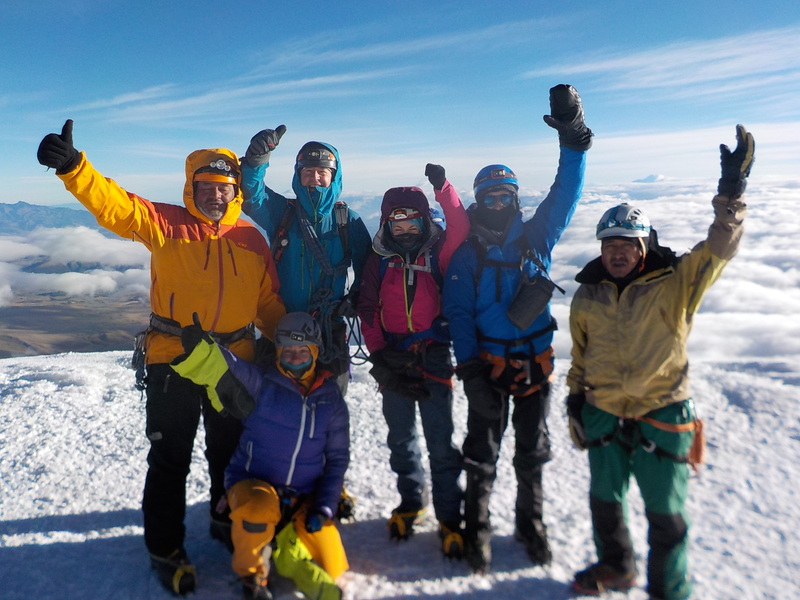 The team Summit on Cotopaxi. 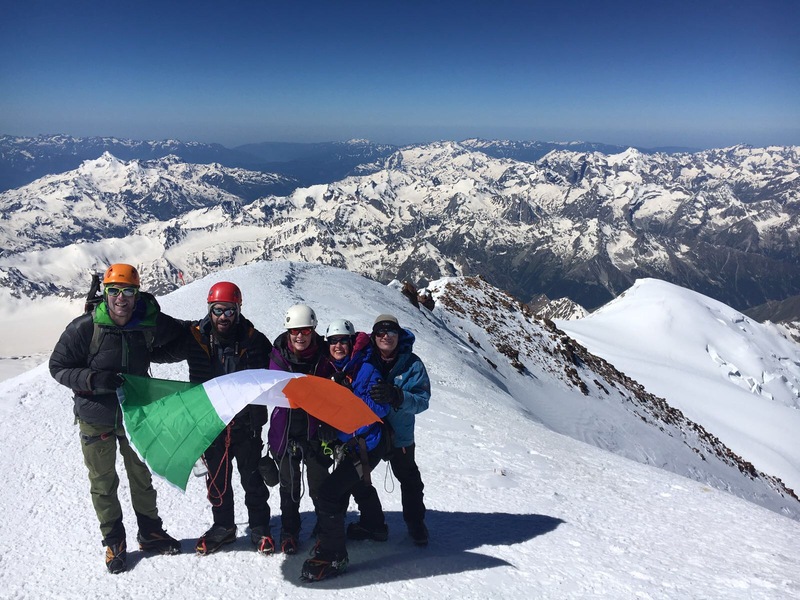 The team have sent some fantastic shots from Pashachoa and Illiniza Norte summit! We headed towards Chimborazo via the town of Riobamba. Upon arrival at Riobamba we checked into the hotel and found that it was one of the nicest places that we have stayed. Just after check in there was a parade along the street in front of the hotel with fireworks flying in all directions before the procession of candle holding people behind the bombediers truck and brass band. This was a bit unexpected. After a leisurely start on Saturday 5th January, we drove up to the start point for our attempt on Chimborazo. We managed to drive off-road all of the way up to 4,800m (about the height of Mont Blanc). Here we chillaxed, ate some pizza, had lunch, left an audio blog and just generally lingered over the space of two hours or so to let our bodies re-adjust to the elevation. Chimborazo was occassionally coming into view in between bouts of cloud/mist and it looked a formidable challange. The summit of Chimborazo is further from the centre of the core of our planet that any other bit of land (due to the equatorial bulge) – it is about 2km further from the centre of the Earth than Everest (8,848m above sea level) despite it’s height only being 6,310m (20,702ft above sea level). We took some photos and Chasqui pointed out on my digital camera screen the route that we were to attempt. The El Castillo Route is about a 40 degrees angle (with a short section of 70 degrees) and is graded grade II / PD and is about 1300m of elevation gain from the Edward Whymper refuge. Chimborazo looked much harder than our guidebook photo due to the retreat of its glaciers. Although we had fleeting glances of Chimborazo it was marginal whether we would get a weather window in the coming 5 days and the freezing level on the mountain was very high (ie the mountain was very warm). We headed up to the Edward Whymper hut at 5,000m at about 12:30pm to wait and see what the weather would do and to position ourselves for a summit push. We quickly nipped up to the hut at 5,000m. On route we saw plenty of ‘Vicuna’ (a wild relative of the llama) in the ‘arenal’ (sand) – the area is so arid that some people compare this area to the Altiplano of Bolivia. We found a small room upstairs in the hut, laid out our camping mats and sleeping bags and relaxed for a short while. We had an early dinner and went to bed at about 4pm(?) ready for having a breakfast at about 9pm and setting off up the hill by 10pm. Whilst asleep, Chasqui woke us up and revised breakfast time to 10pm as the weather had changed. There was very heavy rain on the hut roof occurring between at least 7pm and 8pm and the hut was engulfed in cloud. After the rain finished, there was a continual drizzle onto the hut. The conditions were reminding us of those that we faced at the commencement of the Cotopaxi ascent. When we got up for breakfast at 10pm we discussed the conditions with Chasqui and he discussed them with the guides of the one other group present in the refuge that night. This group were from Colorado. My concern was that the heavy rain earlier in the night could have resulted in significant snow accumulations higher up the mountain that were not consolidated on slopes of 30 degrees plus and hence could present a significant avalanche hazard and that the rain/drizzle could lead to an increased risk of stonefall on the mountain. The guides debated conditions and said to us all to wait till midnight to see if conditions improved. The guides decided to push on up the mountain and see what conditions were like higher up. Leaving at midnight there was little chance of safely reaching the summit and getting back down to safety before the sun was too high in the sky. I decided to remain at the refuge, not get soaked and not waste energy on not getting a summit although it could have been beneficial to get to know the route somewhat. I headed back to my sleeping bag on the hard sleeping mat on the refuge floor for some broken sleep. George wanted to have a go at it and he headed up the mountain with Chasqui. 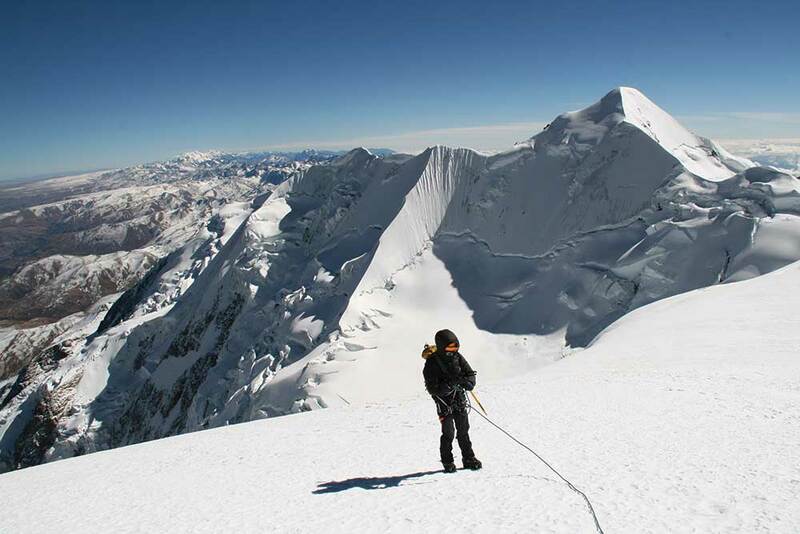 After about an hour of effort, George and Chasqui had made it up to approx 5300m which is still well below El Castillo and just getting to the region known as El Corridor. This is the same height as was recorded on the memorials for some mountaineers who had died on Chimborazo. Due to the conditions being experienced they decided to turn around. There was water running above and below sections of ice. Stones/rocks being stood on were continually sliding away under their feet and one of the guides from the other party had been struck on the helmet by some small stonefall. All this before getting onto the glacier properly. Two hours after George and Chasqui had set off they returned safely to the refuge. Later on the other group returned. The conditions had got colder and the drizzle/rain was now falling around the hut as snow, and the other group had experienced a lot of verglas on the rocks during their descent. In the light of the new morning, Chimborazo exposed her beauty and looked very do-able despite the warm of conditions (see picture above). George went up to some low lying snow pack patches and noted that there was significant slab build up which sheered very easily (ie the avalanche risk was very high) – if we had pushed for the summit then we would have had to risk being avalanched during our descent in the morning daylight. We had definitely made the right call not to go for the summit. We had a reserve day on our programme for attempting Chimborazo. We looked again at the weather information. The freezing level for the following evening was going to be even higher so this meant that the conditions were even less favourable for attempting Chimborazo. Basically, the mountain needs to be freezing from at least 5,000m and above to do it safely. The conditions weren’t right so we made the hard decision to abandon our attempt on Chimborazo. Technically we had all been further from the centre of the core of the Earth than the summit of Everest is. However it was disappointing to have not reached Chimborazo’s summit. Better to retreat and allow us to attempt it another day than to never be able to attempt it again. Hence on the morning of Sunday 6th December, we descended down to the Toyota truck, left another audio blog and cracked open a couple of beers. 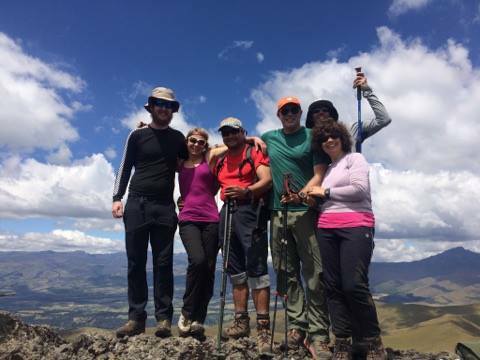 2nd Aug – Josh & Claire have now climbed Fuya Fuya and Illinizas Norte. They have missed out Cayamabe due to the weather. Today they have left for the Cotopaxi refuge and will make their summit attempt tomorrow. 6th and 7th August – ‘Thursday was an easy day. We walked off Cotapaxi and drove to Latacunga and spent the night in a hotel. The next day we visited Quilotoa Lagoon on an Indian reserve. We descended 350m down to the lakeside and everyone except Robinson and I rode a donkey out. Back in Latacunga it was an emotional farwell to Paul who was doing the extension tour. In Quito we had a last dinner together and said our goodbyes to Peter, Niall and Michelle. I was the next to leave at 11:00 on Saturday and hopefully Linda got away on Sunday okay. Ecuador Volcanoes December 2008 Expedition News. 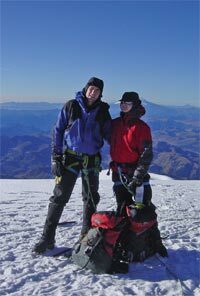 5th Jan The team have all climbed Cotapaxi and due to the weather have decided not to attempt Chimborazo. They are going to spend their extra days sightseeing before heading home or going to the Galapagos.